A great book is more than just a way to escape into another world. It’s a step up for a child’s imagination and development. To help improve early literacy and put more high-quality children’s books in the hands of young kids, Southwest Human Development, one of the nation’s largest nonprofits dedicated to early childhood development, recently published its first-ever children’s book, “Up Up Up,” written by Phoebe Fox and illustrated by Michael Hale—both North Central Phoenix residents. 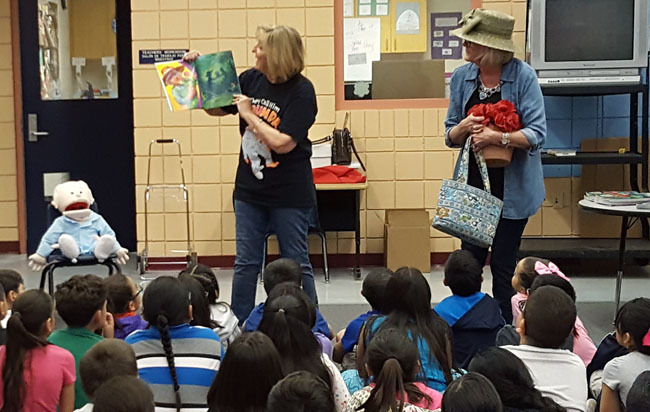 Terri Mainwaring, left, reads from the book “Grammy Likes ME Best,” while her co-author, Bonnie Apperson Jacobs acts out the role of Grammy for a group of children at a local elementary school (submitted photo). Fox also is the author of “Starry’s Haircut,” her first children’s book published last year. “Up Up Up” is a story about a fanciful trip taken up an elevator by a lovable cast of animals on their way to a friend’s birthday party. Fox spent her childhood in North Central and returned in 2003, when she and her husband bought a home in the community. Fox is the mother of three boys, who she says love riding in elevators—which gave her the inspiration for the book. “They especially enjoyed riding the glass elevator at the Burton Barr Library in downtown Phoenix,” Fox explained. Thinking that animals crowding into an elevator would make a very playful children’s story, Fox wrote a manuscript and entered it into Southwest Human Development’s inaugural First Edition Children’s Book Contest. More than 250 entries were submitted to the contest, with “Up Up Up” selected as the winning entry. Fox has been doing in-person readings at various elementary schools, and made an appearance at the Uptown Farmers Market on March 11, accompanied by the book’s illustrator, Michael Hale, and Jasper the sheep, courtesy of Chile Acre Farms. She will be appearing at the Festival of Tales on April 29 at Paradise Valley Community College. 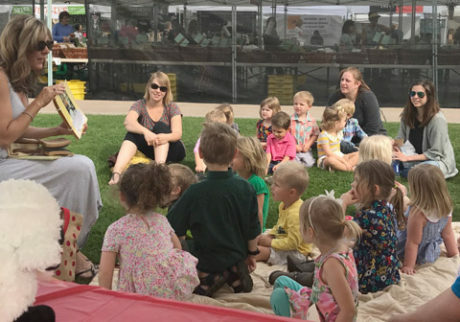 Children’s author Phoebe Fox, seated left, reads her new book, “Up Up Up,” to a group of children at the Uptown Farmers Market on March 8 (submitted photo). Hale has more than 25 years of experience as an illustrator, copywriter and concept designer. He is perhaps most well known for his work as the creative director for the Phoenix Zoo’s Zoo Lights. “Looking back at my work and all of the things I enjoyed the most, I knew what I really wanted to do was create for children,” he said. Hale has his own children’s book coming out in May called “Bad Monkey Business,” which will be available at Changing Hands Bookstore-Phoenix. “Up Up Up” ($13.99) currently is available at Changing Hands-Phoenix and various local shops, including Duck and Decanter, Copper Star Coffee, The Stockroom, and AZ Pops. As part of Southwest Human Development’s commitment to early childhood literacy, sales of “Up Up Up” will also include a “buy one, give one” concept where the nonprofit will donate a book to a child or family in need for each book sold. Their latest story is about Grammy’s three grandchildren and Mitchell the Dog, who each believes that they are Grammy’s favorite. The book details the special experiences each child enjoys with their Grammy … that clearly make a case that she likes them best. Jacobs and Mainwaring are long-time educators, experienced in classroom teaching, early childhood development, library science, school administration and public relations. Both understand the importance of engaging young children in literature. “We are in the process of making presentations at six to eight Valley schools where the students are in need of books and a focus on literacy,” Mainwaring says. “We will be reading the book and giving every child in either first or second grade a signed book.” Among the schools they have visited are Madison Rose Lane and Encanto Elementary Schools. The ladies will appear at Changing Hands Bookstore-Phoenix, 300 W. Camelback Road, from 2-4 p.m. on Sunday, April 2, with the reading beginning at 2:30 p.m. There will be free cookies and lemonade, and the First Draft wine and beer bar will be open for business. “Grammy Likes ME Best” is available at Changing Hands Bookstore-Phoenix ($11.95), and at www.yellowpencilbooks.com.